Fava beans are in season now. 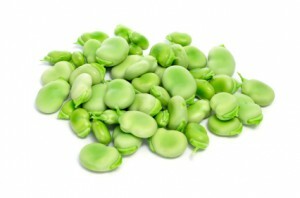 The are also called broad beans or pigeon beans and belong to the pea family with cultivation dating back 5000 years. 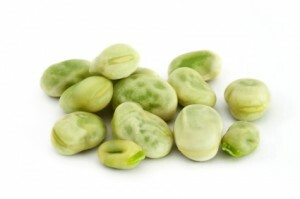 Fava beans are low in fat cholesterol and sodium, a good source of fiber , protein, phosphorus, copper, mangenese. Also, they are a very good source of folate, potassium, vitamin K and iron. 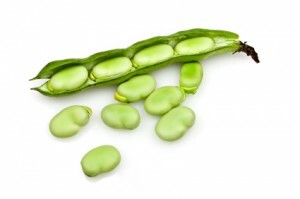 When you go to your local market, you are looking for pods similiar to pea pods but usually larger. Pinch them a little to make sure they are firm and should not have any dark spots. You will need five pounds for four people. Preparing them takes a little bit of time but well worth it for the buttery taste. 2- Parboil the beans for a minute or so, then plunge into a bowl of ice water. 3- When cooled down a little, take the beans out and pinch on one end and the bean will come out of the waxy shell. 4- Then prepare them in one of many ways. – Boil, mash and stir in some butter and olive oil. Spread on a nice warm crusty bread crostini. – Toss cooked beans in a salad with Arugula and goat cheese. Dress with olive oil and lemon juice, salt and pepper. – Serve cooked Favas with olive oil, pepper, salami, prosciutto and shavings of parmesan cheese. You can add them to soups and stews also. They are a versatile veggie and a change from regular peas.